Q. How do I cite a country profile from the CountryWatch database? The Country Watch database has a Citations page which includes instructions on how to cite content in MLA and APA formats. Follow the general format in MLA and APA for citing electronic resources. Author (Last name, First name), & Author (First name Last name). "Article Title." Title of Journal , volume number, publication date, page range. Name of database, URL. For CountryWatch citations, use the organization's President and Senior Writer's name, Denise Youngblood-Coleman, as the author. Let's use the CountryWatch review of the United States as an example. Youngblood-Coleman, Denise, "Country Review: United States." CountryWatch, 2016. Countrywatch.com, http://www.countrywatch.com.ezproxy.library.berkeley.org/Intelligence/CountryReviews?CountryId=182. Youngblood-Coleman, Denise. "United States: Political Conditions Part 1." CountryWatch.com, September 2016, http://www.countrywatch.com.ezproxy.library.berkeley.org/Intelligence/CWTopic?Type=text&CountryID=182&Topic=POPC1. Why is there a difference between citing the general review of a country and a specific article within the review? Consider the general country review (the first page you come to on CountryWatch after selecting a country) as a larger publication which contains many smaller articles (the links on the left sidebar). CountryWatch reviews are updated at least once a year. 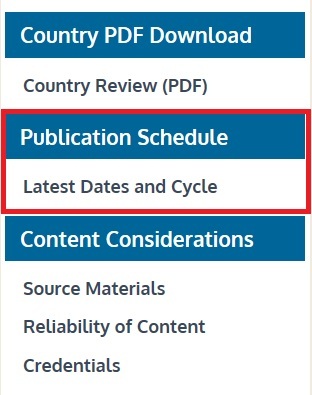 More information on publication dates can be found by clicking on "Latest Dates and Cycle" under Publication Schedule on left sidebar of Country Review. 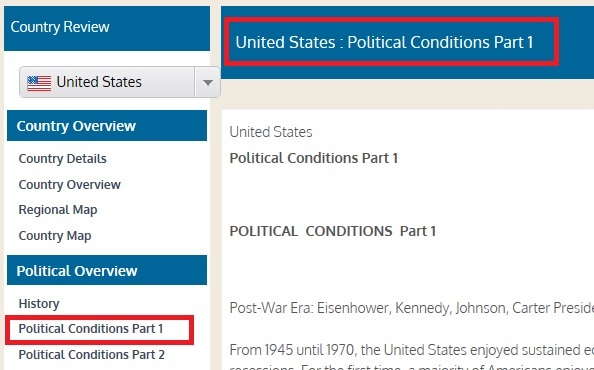 Many times, the last page of the Political Conditions pages will list when page was last updated. For the example above, the last page of the United States: Political Conditions pages noted "as of September 2016." Take the time to look for the publication date, or last updated date to use in your citation. Since information on CountryWatch is reviewed and updated continually, you need to specify both when and where you retrieved the information you are citing. Consult our Writing & Citing L﻿ibGuide for more information on how to cite using MLA and APA.